Hello, my above average, well educated peeps! I just read this and thought you'd get a kick out of it. Comes from the PPNF (Price-Pottenger Nutrition Foundation) Health Journal. "Scientist at the Agriculture Department's U.S. Dairy Forage Research Center in Madison, Wisconsin, have been studying a substance called conjugated linoleic acid or CLA that occurs in butterfat. Many studies over the past 12 years have established that, at least in laboratory animals, CLA offers some protection against breast cancer and other malignancies, apparently through its role as a potent antioxidant. In addition to anticancer benefits, CLA also seems to dramatically reduce the deposition of fat. Livestock eating feed supplemented with CLA tend to lay down more lean tissue and dairy cattle ingesting CLA-enriched diets have greater milk productivity. 'Much to their big surprise,' scientist found that the highest level of CLA in milk was obtained with cows just eating pasture - nothing else, according to Larry D. Satter, director of the forage center. Satter finds the notion of pasture feeding 'a far-out idea'. Those familiar with the work of Weston Price know that pasture feeding is the only way to provide healthful, nonallergenic, nutrient-dense dairy products to the populace. Could it be that CLA in America's pasture-fed cows at the turn of the century not only protected against cancer but overweight as well and allowed mothers to nurse successfully because they had plenty of milk? Meanwhile, University of Wisconsin scientists are trying to figure out ways to mass produce CLA as a food additive." So much slapping my head going on. What a miracle! 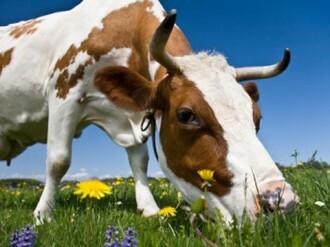 Cows that eat what they are intended to are healthier and make you healthier! We can only hope that someone spent about a billion dollars to figure this out. And mass producing CLA - this makes me die. Please, let's not just eat grass-fed products, no, of course not. Let's try to make a food additive instead. We do want to go for the least amount of making sense possible, OBVIOUSLY. Just another reason for you to encourage and support farmers who have a brain. Buy grass-fed milk, meat and dairy, lovies!